This post wouldn’t have existed if me and my wife weren’t so open to discussing our body hair. I’m a burly man with facial (and not only) hair for generations to come. And, honestly, she can easily keep up if she decided to go all natural. A note: I wouldn’t mind that, actually! However, she prefers trimming it and styling it in ways I didn’t imagine even existed. For this, she uses this gentle Schick trimmer from Amazon.com. We pondered that. 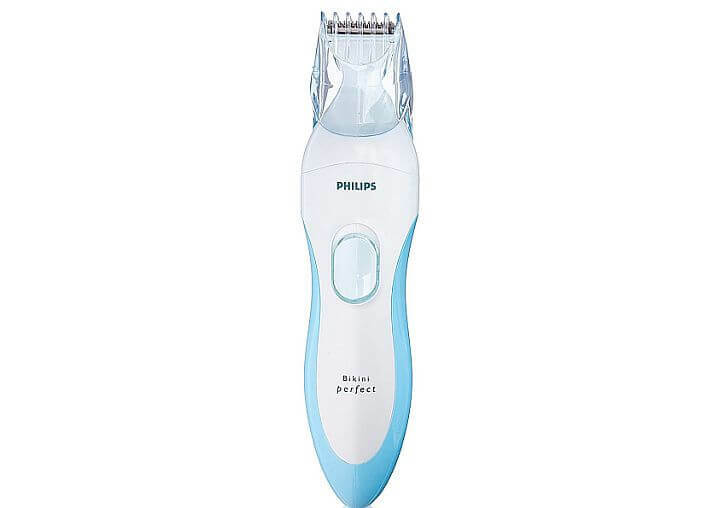 The best reason we came up with is that with the best bikini trimmers, you usually get a no-bells-and-whistles product that’s designed particularly for that purpose. When we discussed pubic shavers, it was obvious that a lot of them come with a myriad of attachments. This makes some of them run a bit more expensive. The thing is, it’s hard to nail only one trimmer. Not to mention that some ladies, unlike my wife, prefer to use a razor on their bikini area. So the best we could both do is draw from her personal experience – and that of others, and present you with a quick list of the best bikini trimmers and best bikini razors. No, you’re not hallucinating: we’re recommending you a cheap, simple product instead of an ultra fancy bikini hair trimmer. It simply works. 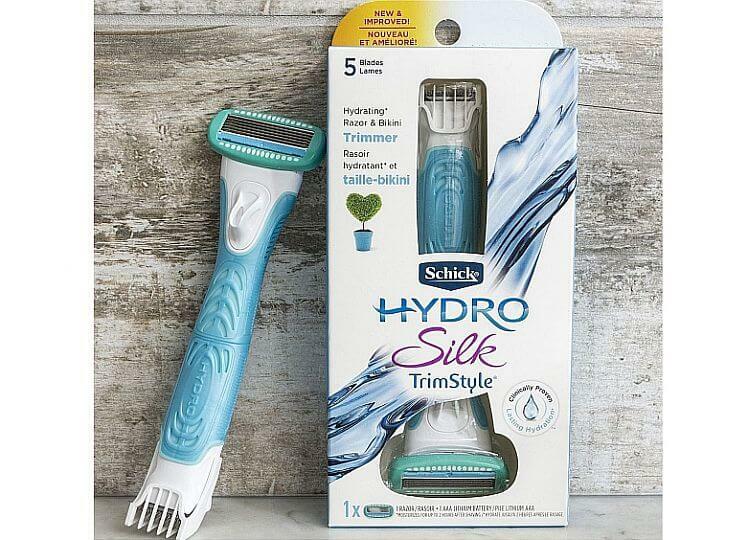 We’re a Shick family – my wife uses the TrimStyle, while I switched to Shick Hydro 5 razors for my beard. Both are inexpensive and provide a great shave. What’s beautiful about the TrimStyle is that you can use it either as a bikini area razor, or as a trimmer. Want to go all silky smooth? Or rather leave a bit of a fuzz? You’re free to do both with only one product! The real secret lies in Shick’s moisturizing technology. The usual pain with trimming/shaving comes after you groom yourself. Shick have the so called Hydra-Boost serum with gentle shea butter. It will moisturize your skin so you don’t get hit by irritation – something that many “best” electric bikini shavers fail to achieve. To further make sure your silky skin is protected, the razor has five blades with skin guards that follow your contours. The trimmer itself is waterproof and comes with an adjustable combs with 4 settings. You can either go as-close-to-shaved-as-possible, or leave a bit more bush. Imagine your standard women’s razor. Now, go back to the Shick Hydro: the surface of the blades is a bit wider than classic razors. At the same time, it’s a little bit narrower than electric bikini shavers. In other words, you’ll cover some decent area on every go – but not as much as electrics. The downside is that you have no bells and whistles, just a very straight-forward, plain product. But honestly, do you really need to care if it gets the job done? Especially when you have a bit of a rubberized grip to avoid slipping and possibly nicking that gentle skin! For my wife this is an inexpensive, reliable way to trim her bikini area. High chance you’ll be that satisfied too! Alright, so things are getting a little bit fancier here. My wife has used the 6 attachment model of this product, as we discussed in our best pubic hair trimmers article. However, if you want to focus on your bikini line, you don’t really need all 6 of them. Plus, you’ll save a bit of money you’d pay for a premium that doesn’t make sense. 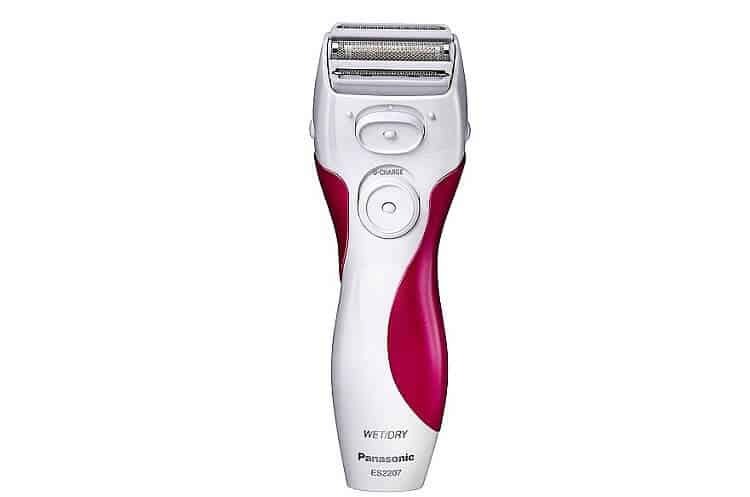 The best thing about Panasonic’s electric bikini trimmer is the 60 minutes of cordless operation. I can be also used both wet or dry, depending on how you feel about trimming your bikini line. A neat little detail is that you still get a travel bag for free for some easy, stylish storage. So, how is the trimming itself? Is it close? Is it irritating? Philips definitely know how to take care of women with their hypo-allergenic blades. This model doesn’t stray from the path. Don’t worry, it’s gentle enough and shouldn’t pull your hairs unless you intend to do so. That said, the Shick might be the one of the best bikini trimmers for coarse/thick hair. Pure electrics sometimes struggle with that. My wife’s bush, as I mentioned, can be pretty dense. That’s why she uses her Panasonic mainly for other body hair. At the same time, though, the Perfect Bikini gives you an easier, non-manual bikini trim. Some people prefer the best bikini razors in electric type exactly because of that: it’s a relatively “hands-off” approach. Plus, let’s be honest – Panasonic’s design is way better. It looks cuter, and it looks cute while doing a mighty fine job with a bit more customization/length control options. Really one of the best bikini trimmers I can recommend. This is more of a general purpose electric shaver. 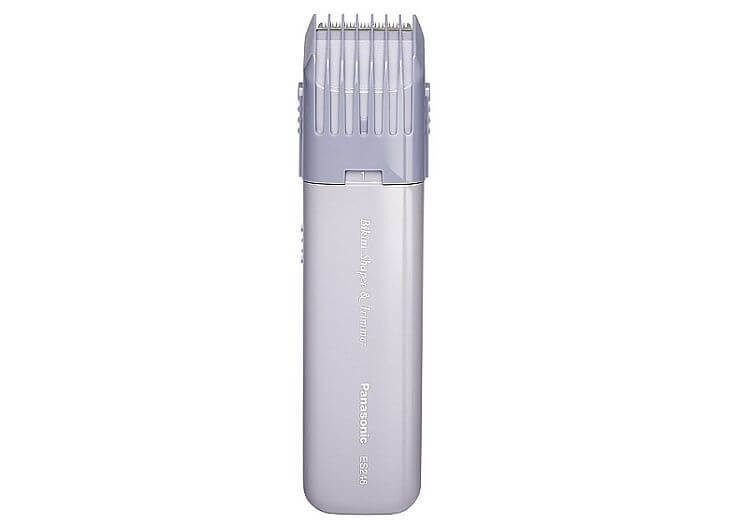 However, there’ a pop-up bikini hair trimmer for close shaves – so the ES2207P makes the list! Alright, so the best/worst thing about this bikini line trimmer is its head. By that, I mean that it leans on the bigger side of things. On one hand, you’re able to cover more area when you trim with it. On the other, it can get frustrating to properly move around your curves down there. A bit bulky for some, including my wife. The thing is, this Panasonic is amazing for dry shaving. In fact, it outshines other similar electrics if it’s about going dry on your bikini line. The blades are gentle and cut/trim with accuracy and without skipping on stray hairs. An important note is that you either want your skin to be completely dry or completely wet when using this one. Otherwise you’ll risk pulling hairs or cutting yourself. Its charge lasts more than the Philips (that also depends on how thick your hair is to some extent.) It’s recommended to charge it after every use just in case – you don’t want to risk it losing power and pulling on your bikini area hairs. Overall, this is a good combination. You can either use it as tentative best bikini trimmers, or extend its use to arms and legs. Something you can’t do with the Shick, for example. If you want something lightweight, portable and cheap, this will become your bikini line’s new best friend. There’s no other electric shaver for sensitive bikini skin that is so light and easy to work with. Can you imagine a width of only 1.5″? To make things better, you have 5 adjustable trimming lengths. A bit more control over shaving or trimming your bikini line compared with other options. The two main drawbacks here are that this neat little shaver is neither waterproof, nor ready for wet usage. So if you like trimming yourself under the shower, you’d have to pass on the small ES246AC. If you can live with that, you’ll enjoy the combination of skin-friendly blades and intelligent protection through the plastic “barriers”. Definitely one of the best bikini trimmers for sensitive skin out there. A total no-brainer given its very affordable price, really! Trimming your bikini line using the best bikini trimmers and best bikini razors can seem pretty intimidating if you’re doing it for the first time. However, it’s absolutely simple as long as you take your time and don’t rush it too much. Now, if it’s your first time to use these best bikini trimmers and best bikini razors, chances are you’ll have quite a bit of hair to take care of. Don’t grab your electric bikini shaver (or razor) yet! These are not ready to cope with so much hair. Instead, get a pair of scissors and take off some inches until your hair down there is shorter. Don’t be misled by some people calling them “bikini hair clippers” – these products were designed for more detailed work. If you’re using one of the best bikini razors, get your shaving cream or gel ready. You need to go wet with most razors, unlike hair trimmers. If you have an electric shaver/trimmer, you can easily go dry without prepping your bikini line skin. Be patient and go slowly. Rushing through it will lead to pulled hair or nicks and the bikini area is one of the last places you want to get skin irritation! The golden rule of any body hair trimming is to shave in the same direction it grows to reduce the risk of razor burn. The same applies here too. With these best bikini trimmers, you’ve got a bit more leeway, as a lot of them have protective “caps” going over the blades. So even if you go against the grain, you shouldn’t experience huge inconveniences. First, moisturizing your skin. This is a complete must and not doing it is simply begging for irritation and headache. My wife loves the Shick bikini razor exactly because of its automatic moisturizing feature. However, most of the standard or the best bikini razors or bikini area electric shavers don’t have this option. In other words, it’s up to you to grab some moisturizer and apply it once you’re done. Go for a non-scented product, if possible. Perfumed varieties can irritate your skin. The second thing involves cleaning up your trimmer/razor. With most personal shavers for bikini areas, this involves a quick rinse under the tap to remove leftover hairs. Others will come with a cleaning brush you should use to clean up. Whatever the product is, make sure it’s kept clean and unclogged. This will guarantee a more enjoyable next grooming session for you and your skin.